Sheri has a BA in social work and joined Wycliffe with her family in 1991. 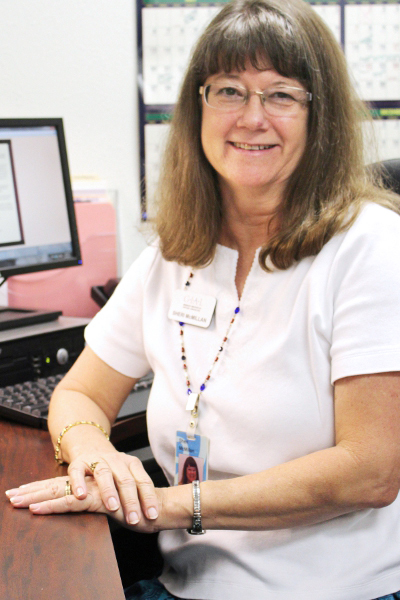 She has served at the International Linguistics Center as Welcome Desk Receptionist and Hospitality Coordinator, as well as in related ministries. A tremendous highlight was attending a Bible dedication in Peru, celebrating the Northern Conchucos Quechuas receiving the Bible in their own language. Sheri transitioned to Wycliffe Associates supported staff in the fall of 2013, beginning her new role with Dallas International that December. She also continues to work at the Welcome Desk on Monday mornings where she enjoys welcoming arriving students and meeting prospective students. Sheri is a Navy Chaplain’s daughter, a Marine wife and daughter-in-law, and Air Force mother to her two sons. She once went parasailing over the Indian Ocean. Lake Lucerne, Switzerland, was the first place she remembers being moved to tears at the beauty of God’s creation. Her favorite place to go is the North Carolina mountains. She speaks some Spanish, and less Portuguese, but would most like to visit Brazil, as that’s where her daughter-in-law was born.